A while back, I made a handle grip for my Weekender Bag. Then I made one for the Weekender Bag I made my sister for Christmas. It seemed like a fairly simple project, so I thought I would share it with you in the form of a tutorial. Well, putting this together has definitely been a learning experience for me, but I am happy to finally be able to present you with this tutorial. Template and somewhat abbreviated instructions without images are available here. I hope you enjoy it. Please let me know if you make one and how it goes! 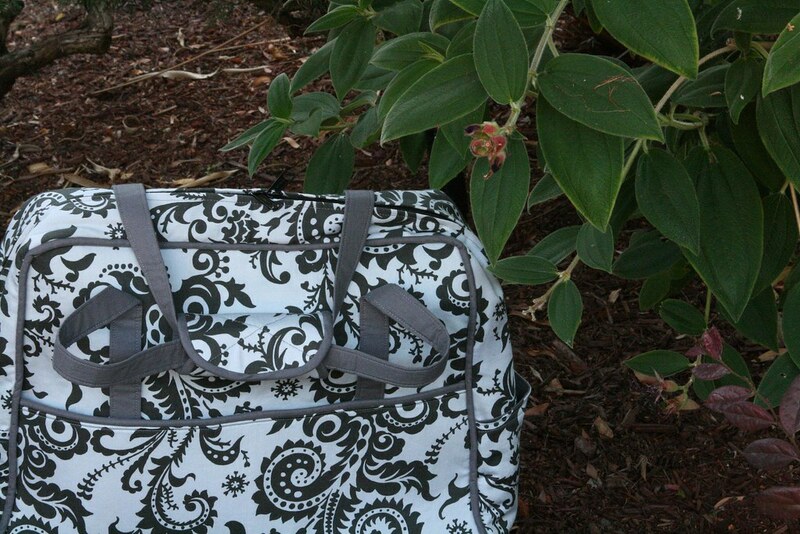 What better accessory for your Weekender Bag than a coordinating handle grip? 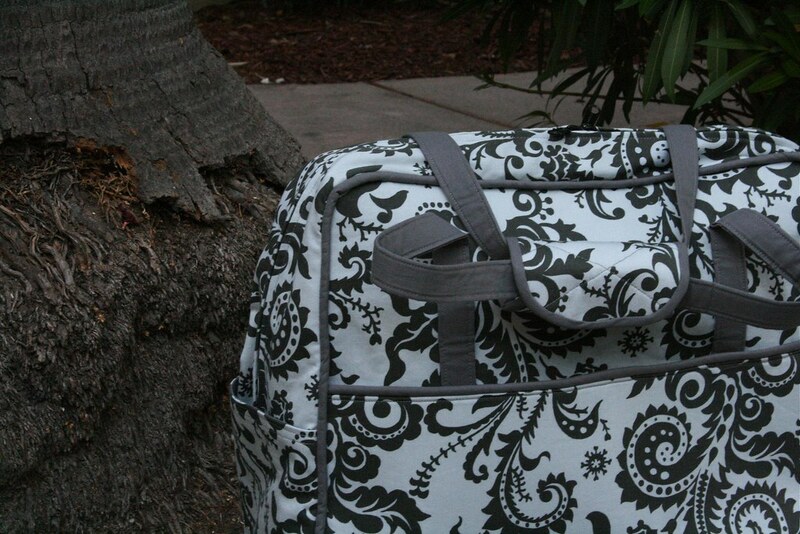 It keeps those handles from digging into your hands when you’ve packed the bag full to the brim. 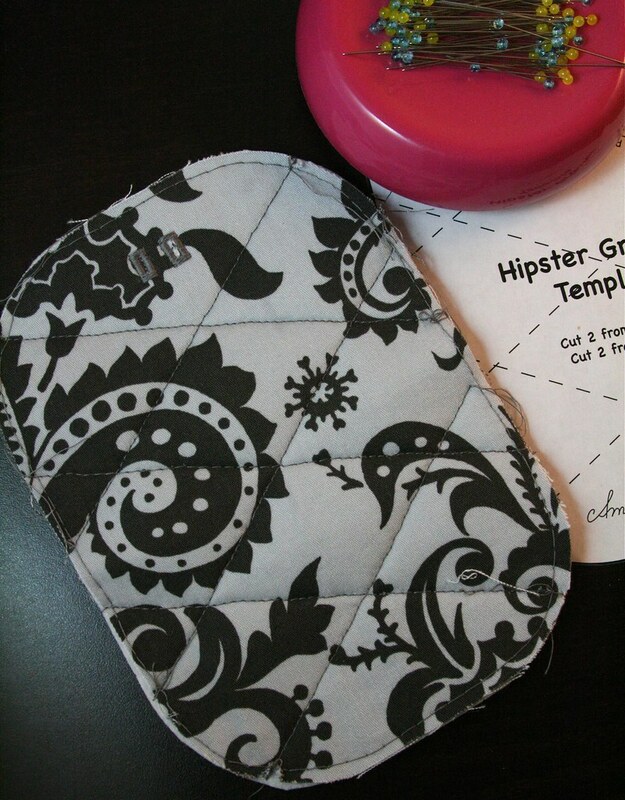 The Hipster Gripster is easy and quick to make and almost all the items required to make it should be in your pile of Weekender Bag scraps and leftovers. 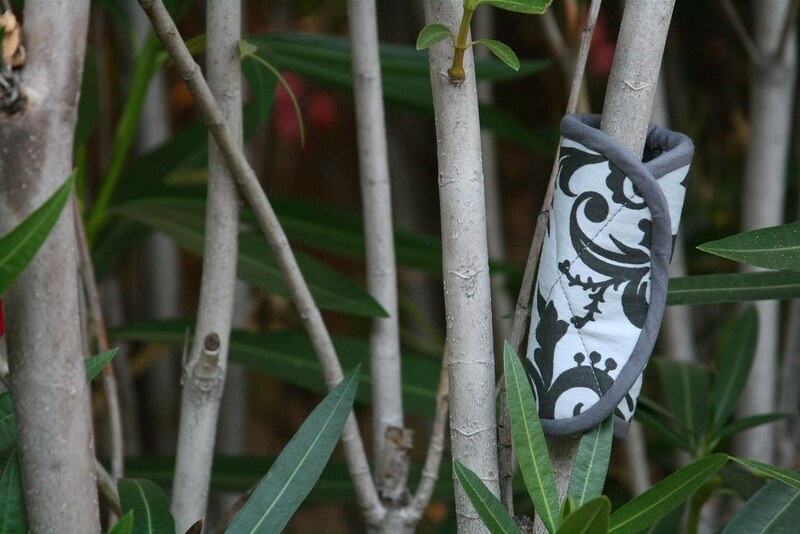 As a bonus, it’s removable, so you can use it on other bags too. 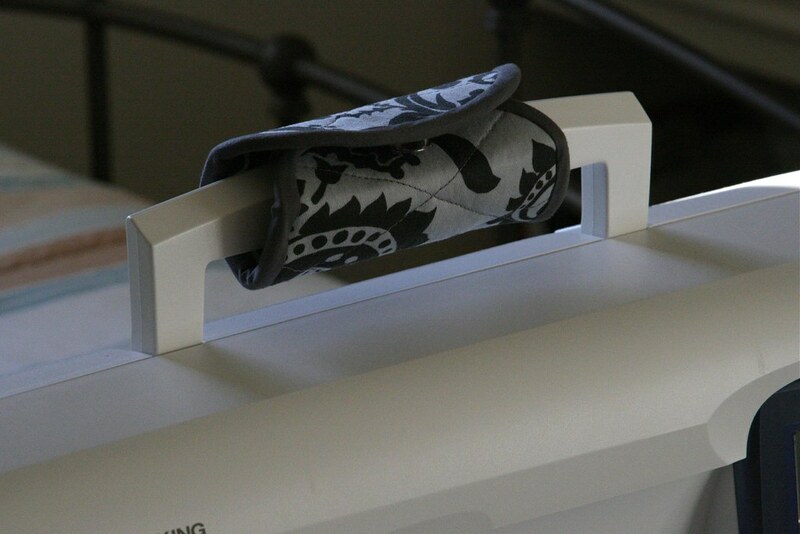 Even works great on those highly un-ergonomic sewing machine handles! * If you are being very observant you will note the buttonholes in the pictures are not in the same location as the ones on the template you printed out. The template is correct (I changed it after the pictures were taken because I did not like this version). 1. 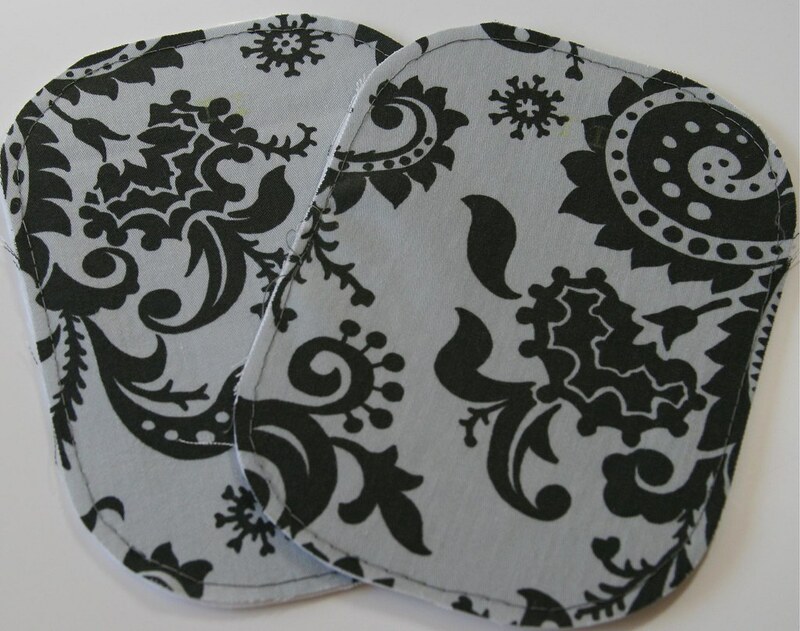 Using the template, cut out two pieces from Fabric A and two pieces from the Timtex. 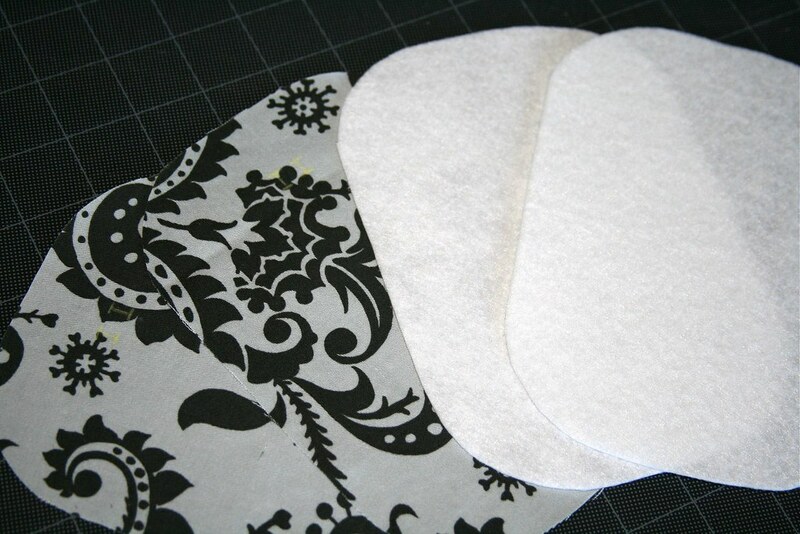 Be sure to transfer the buttonhole markings to both pieces of Fabric A. 2. 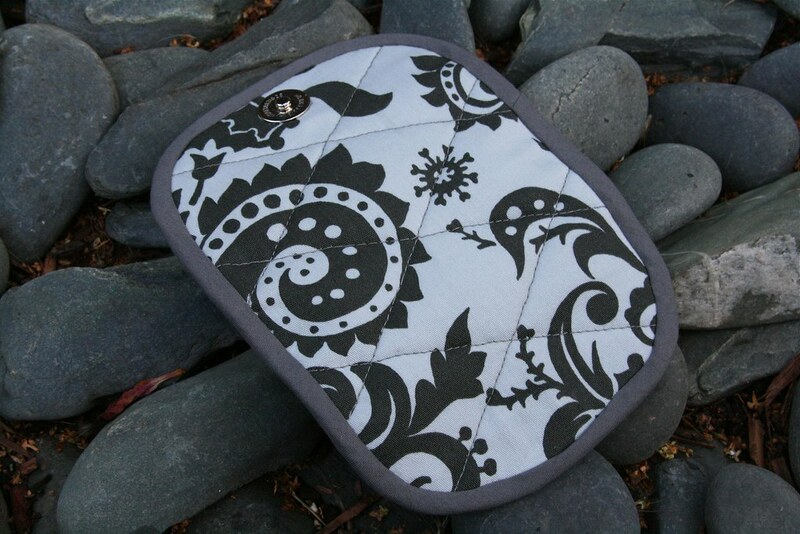 Place one piece of Timtex on your work surface and then place one piece of Fabric A right side up on top of the Timtex. 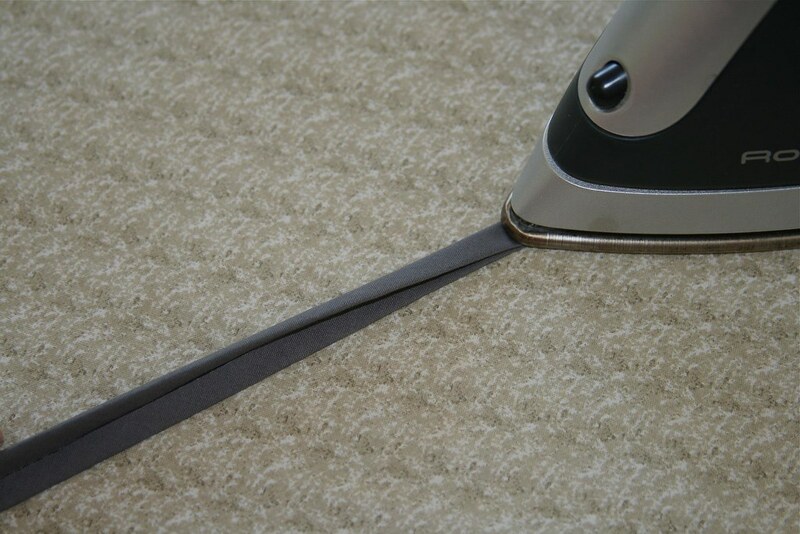 Using a walking foot, baste near the edge all the way around. Repeat with the other pieces of Timtex and Fabric A. 3. At each of the four buttonhole marks make a 6mm buttonhole. 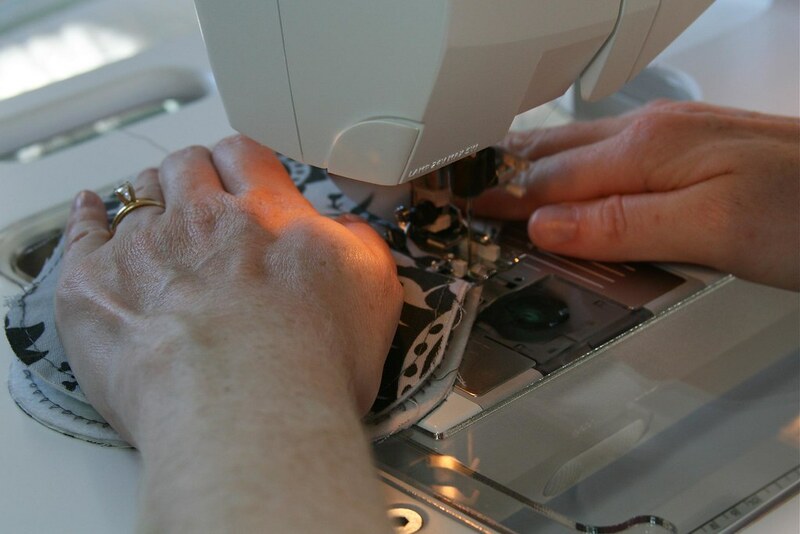 Open up the buttonholes with a seam ripper. Making the buttonholes is optional but I highly recommend doing it. 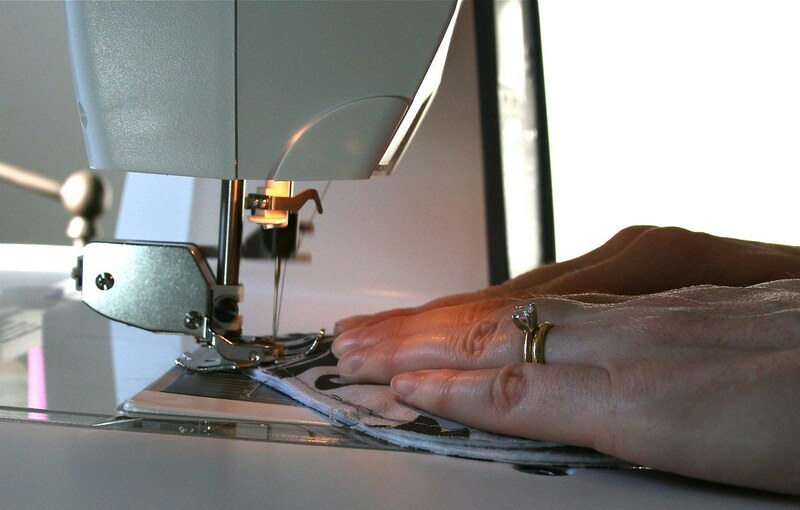 If you skip making the buttonholes, you will still need to use your seam ripper to make slits through the Fabric A and Timtex where the buttonholes are marked. 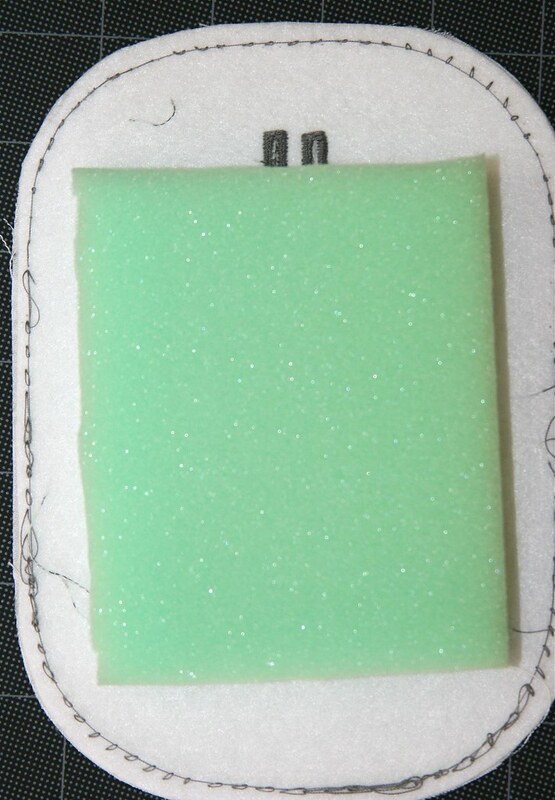 Then place your other Fabric A-Timtex set on top of the foam with the right side of Fabric A face up. This time, be sure your buttonhole is on the opposite end of where the buttonhole is on the other piece of Fabric A. (Note how in the previous photo the buttonholes are at the top and in this photo the buttonholes are at the bottom.) 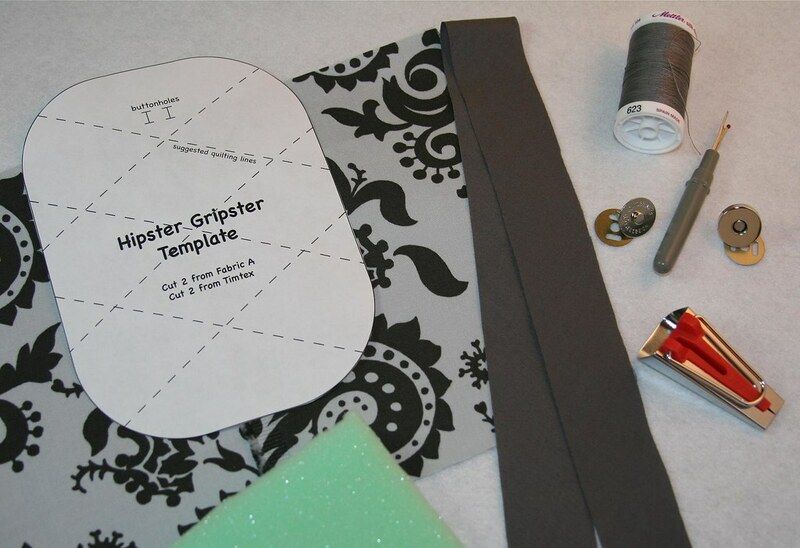 One buttonhole will be on the “outside” of the Hipster Gripsterat one end and the other buttonhole will be on the “inside” of the Hipster Gripster at the opposite end. You should now have a sandwich that is Fabric A—Timtex—Foam—Timtex—Fabric A. 5. Using your walking foot, quilt the sandwich together following the suggested quilting lines on the template. 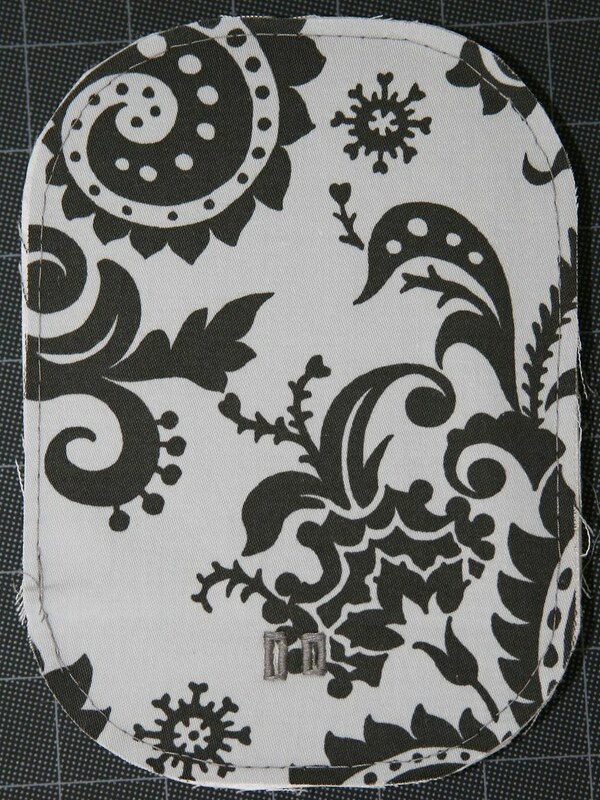 The quilting lines have been positioned to make it easier for you to insert the magnetic snap in the next step. 6. The magnetic snap has four pieces—the male and female snap parts and two disks. 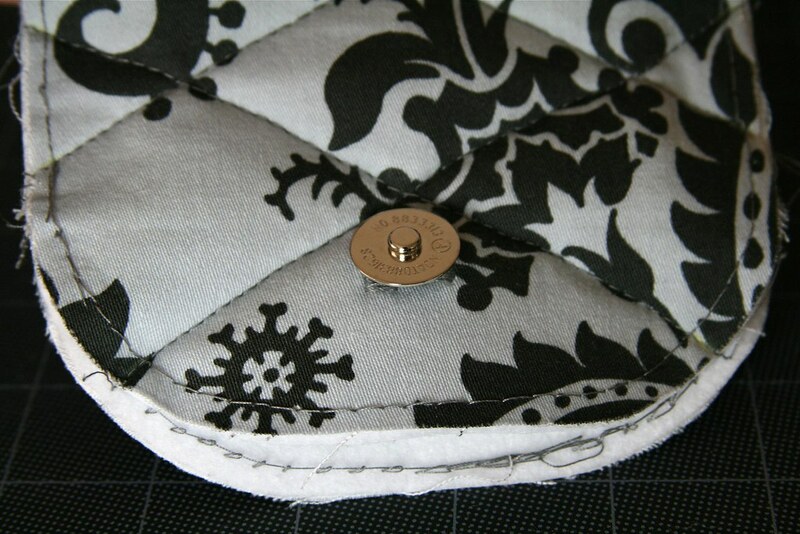 To insert the snap, place one disk under the Timtex at one of the buttonhole locations, lining up the slits in the disk with the buttonholes. 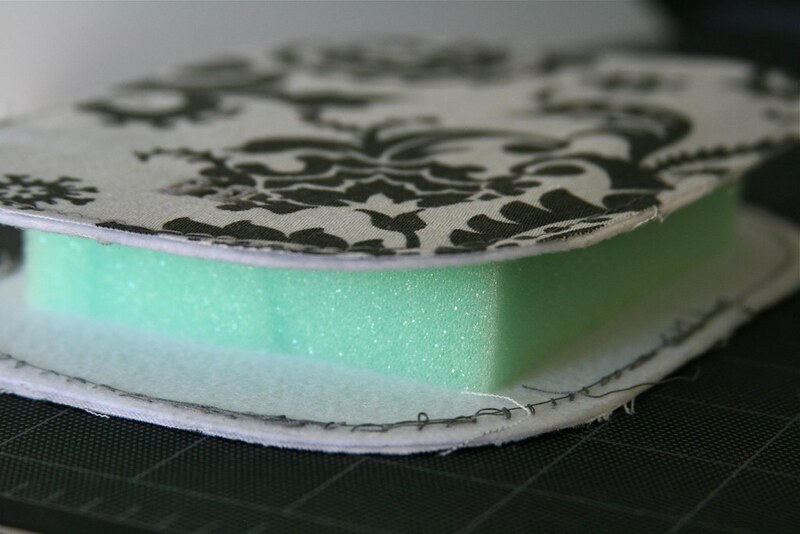 Note that your foam will be smaller so it should not be in the way of your buttonholes at all, like it is in this photo. Insert the tabs of the snap through the fabric, the Timtex, and the disk. Fold the tabs over (either toward each other or away, whichever you prefer). This can be hard to do. You may need to push them against a table or something solid to get them to fold over flat. Do the same for the other half of the snap in the other buttonhole. 7. 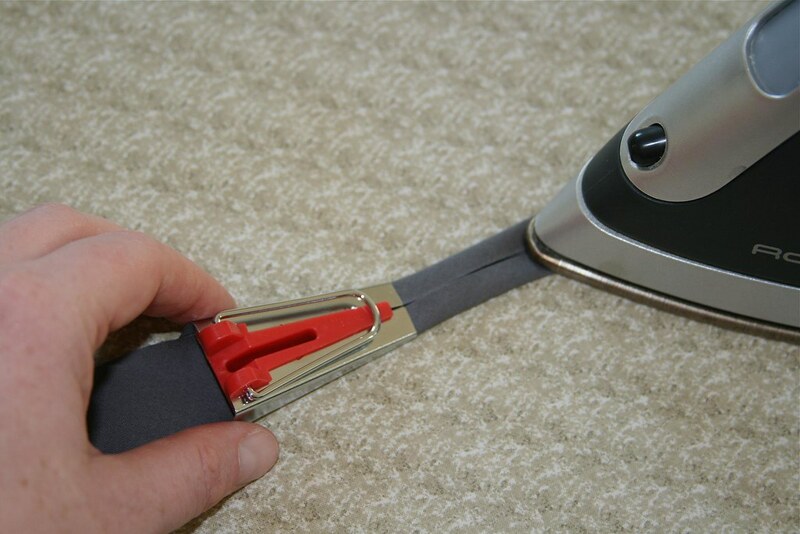 Use your bias tape maker to make bias binding from your strip of Fabric B. 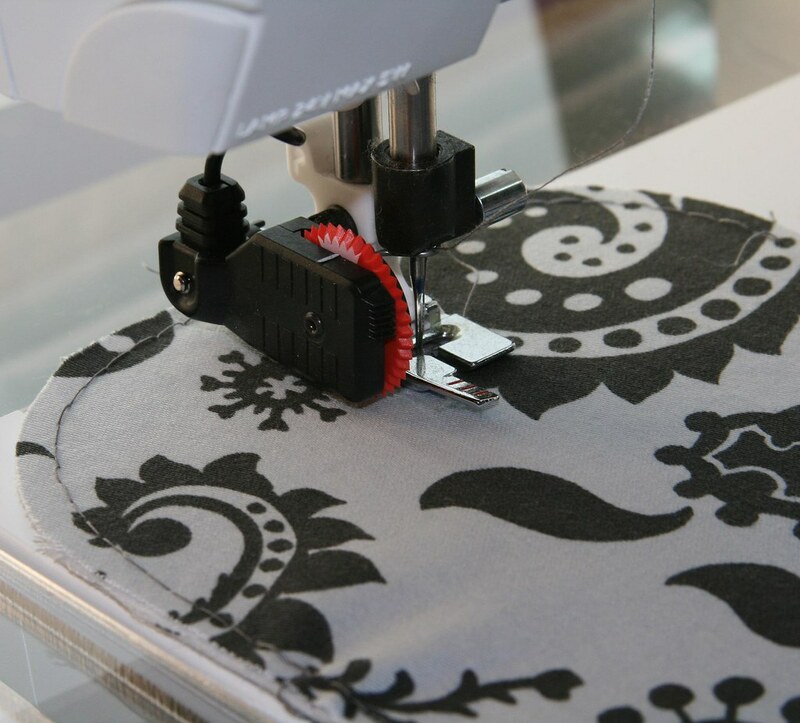 If you don’t have a bias tape maker you can create bias binding by folding the fabric strip in half lengthwise, wrong sides together, and pressing. Then open out the binding and fold both raw edges in toward the center crease and press again. 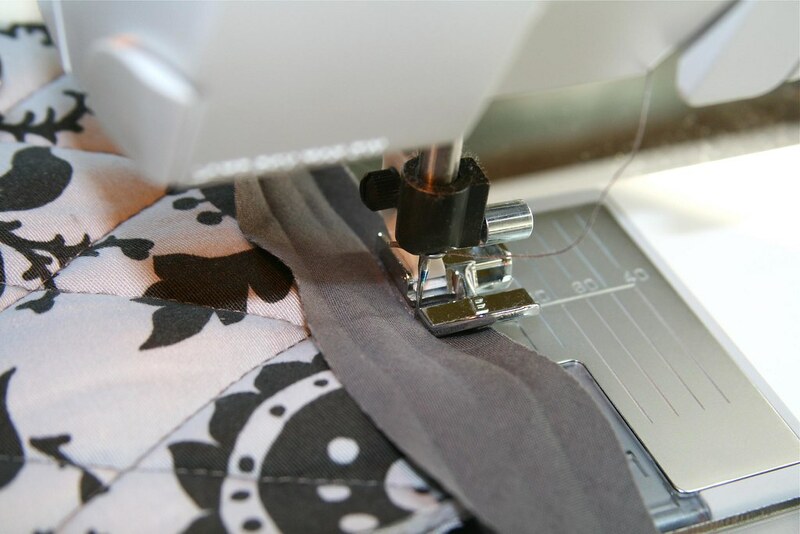 To make attaching the binding easier, use a narrow zipper foot on your machine and/or set your needle position as far to the left as you can. 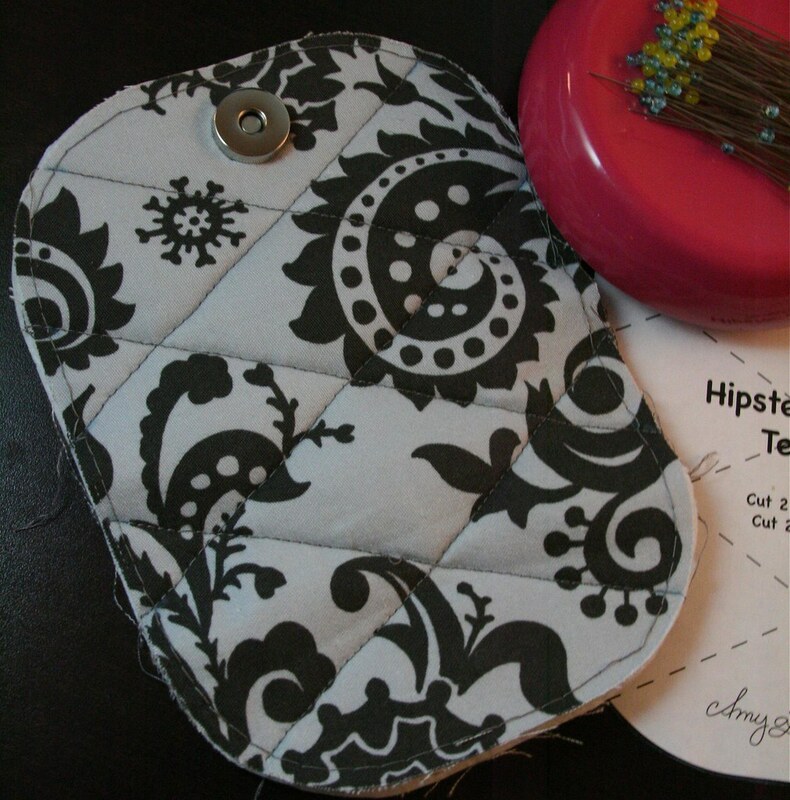 This will help as you sew around the snaps on the ends. 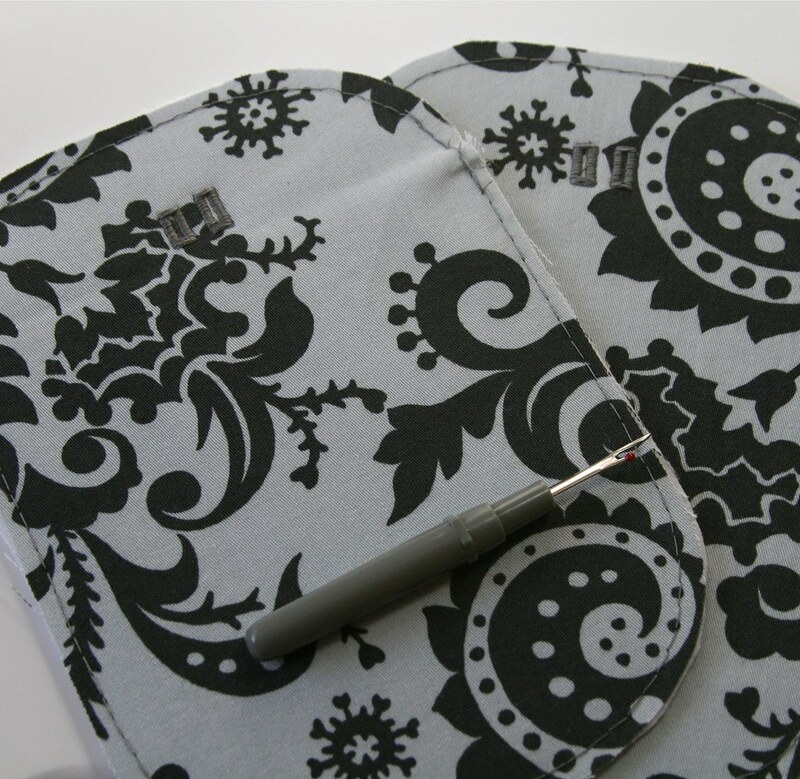 Also, it may be helpful to cover the magnetic snap with a bit of fabric to help keep it from attaching to the metal throat plate on your machine as you sew. 8. Open out the bias binding onto the Hipster Gripster, right sides together (it does not matter which side of the Hipster Gripster you use as the right side). 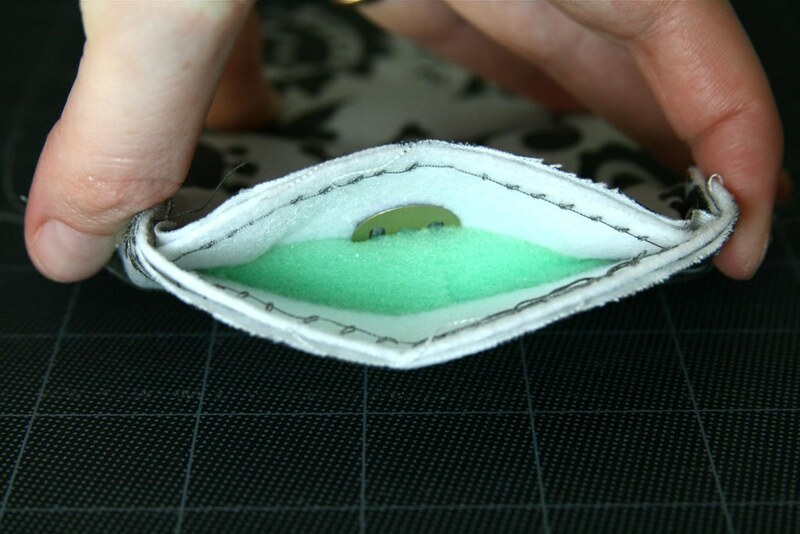 Align the raw edges and sew approximately 3/8” from the edge, or at approximately the first fold line, all the way around, being careful near the snap, especially on the end where the snap is not visible to you. 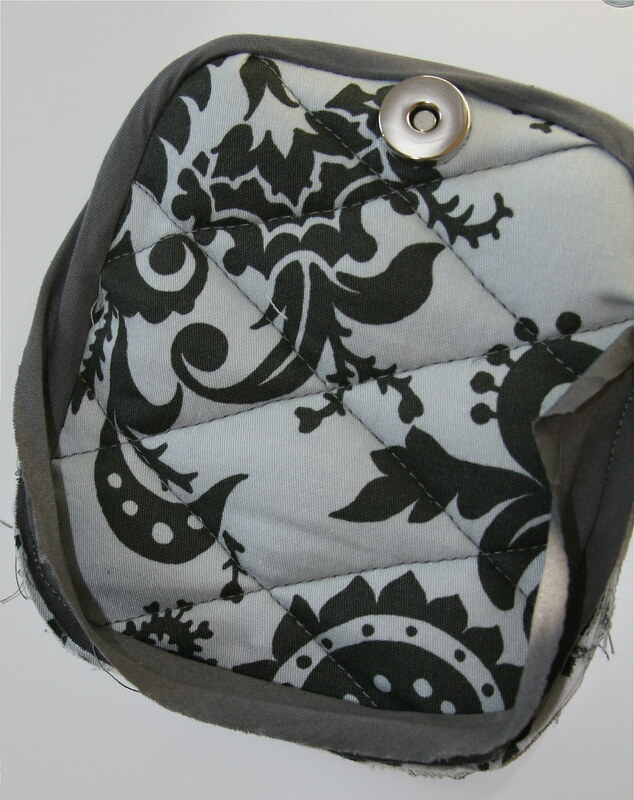 When done, turn the binding to the other side and hand stitch in place using a slip stitch. 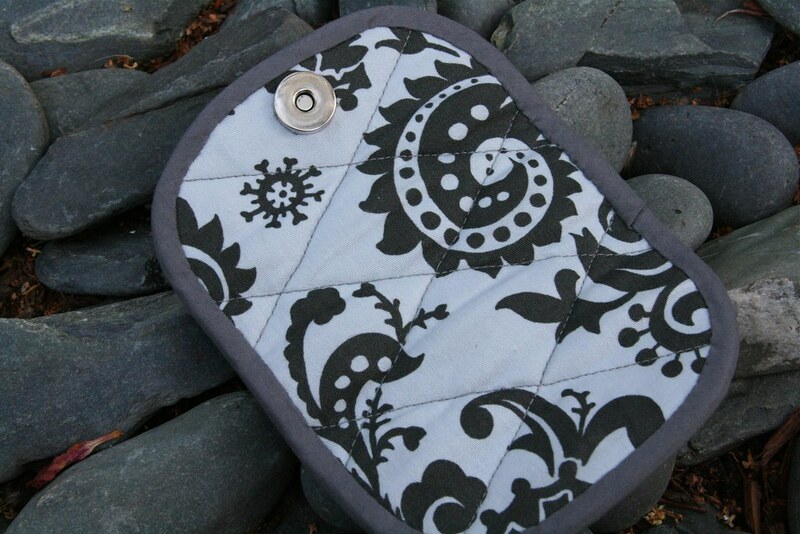 If you need further details on how to attach a binding, I recommend Heather Bailey’s tutorial. Also, many books include instructions for this, including Amy Butler’s In Stitches, Denyse Schmidt Quilts, Joelle Hoverson’s Last-Minute Patchwork + Quilted Gifts, and The Quilter’s Ultimate Visual Guide. Note that I do not recommend binding methods where the entire binding is attached by machine, as for this project the sewing can get a bit fussy around the snaps. The back (or front). You can actually use it either way, so you could use different fabrics on the two sides to match two different bags, or two different moods! If anything is confusing or unclear, just let me know. And don’t forget to send me a photo of your Hipster Gripster if you make one! Thanks for the tutorial! This is still on my project wish list. You should definitely submit this to whipup.net! This is fabulous, such a fantastic idea! I’ll be linking to this. Oh very clever and cute! My fellow on Facebook shared this link with me and I’m not dissapointed at all that I came here. This is a really great idea!! Very useful tutorial! 2007-2012 Amy Hodge. 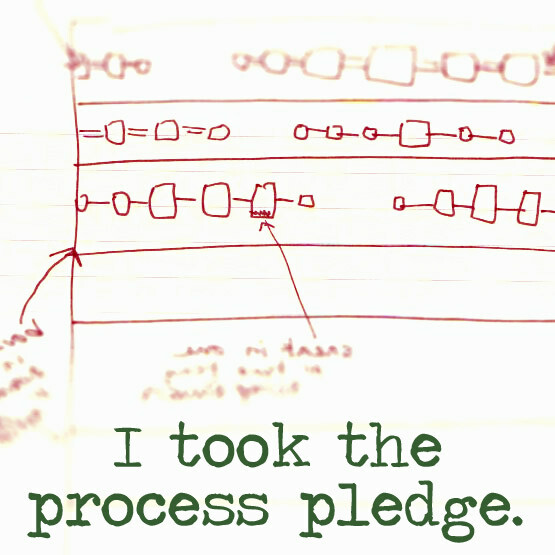 All photos and information on this blog are the property of Amy Hodge. Feel free to link to my content to your heart's content! However, please do not use any of my photos or content elsewhere without my permission. E-mail me if you would like consent to use my content. Thanks. 35 Vintage Button Icons For Your Mac! Click photo above to download 3.4 MB .zip file with instructions.